Thursday morning wasn’t the first time Tyler Toffoli answered questions about his goal scoring. He answered similar questions after netting the overtime game-winner at Madison Square Garden on Monday and then again one night later when he scored twice against the New Jersey Devils, bringing his total this season to a tepid but improving 11 in 53 games. “Gotta keep scoring goals,” he replied. Really, all that’s been separating Toffoli from more frequent post-game interviews is that pesky, career-low 4.96 five-on-five shooting percentage. He hasn’t compensated for that dip with power play production; on the contrary, he’s been moved around on the man advantage between the point, the half-wall and as a trigger-man in the slot. The results have been a career-low 8.4 shots per 60 minutes of power play time, so when he beat Keith Kinkaid with a laser beam teed up by Anze Kopitar for the game-winner on Tuesday, he registered only his second power play point (!) of the season. He’s yet to register a power play assist. 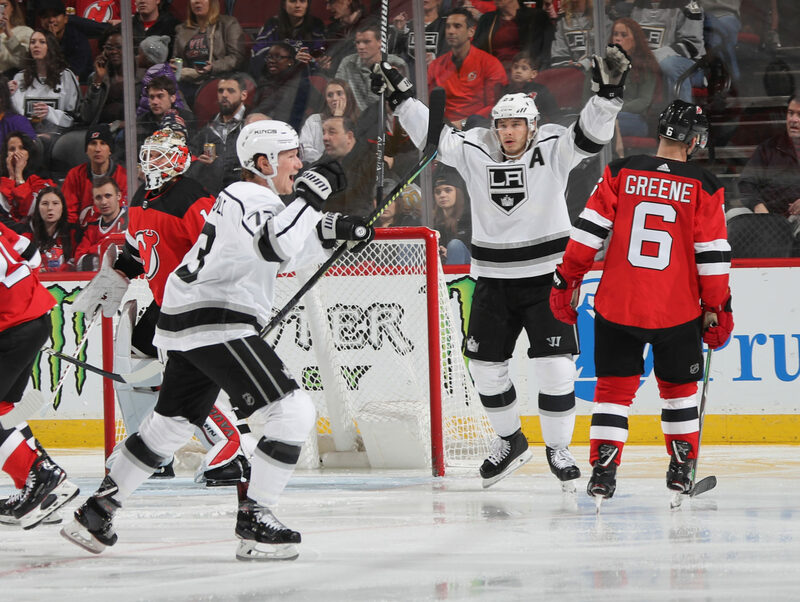 “I try and make sure I’m getting shots from Grade-A scoring opportunities,” Toffoli said. With a team-best 9.33 scoring chances per 60 minutes, per Natural Stat Trick, he’s been doing that. Even his high-danger chance generation rate is the best on the team out of anybody who occupies a power play slot. He’s been getting inside. He’s been getting to scoring areas. He’s on pace to take 234 shots. The pucks just aren’t going in. It’s part of the team-wide low-tide of offense that has depressed numbers across the entire roster. Because he hasn’t been able to compensate for it with power play production, it hits Toffoli particularly hard. Luck probably plays a role. His PDO is 988, sustained by a .928 five-on-five on-ice save percentage impacted by Los Angeles’ sturdy goaltending. But the team’s 5.96% shooting percentage with Toffoli on the ice ranks 394th out of the 428 players to have played a minimum 500 minutes of five-on-five time this season. 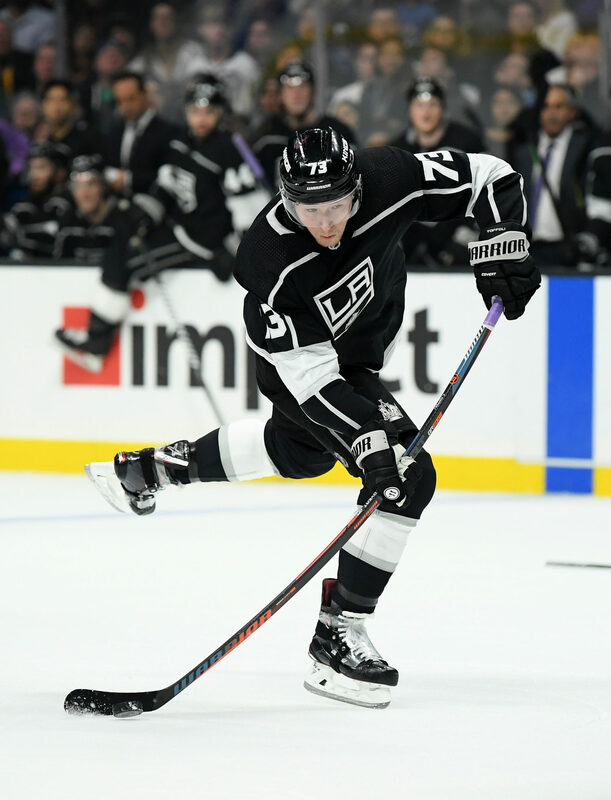 Toffoli’s name has been brandied in trade reports, but unless heaven and earth is moved for him, the Kings aren’t expected to trade him at the deadline, nor will they be easily persuaded to at a later point. The preference is to keep younger players, assets and prospects, not move them. This is the first real time that Toffoli has had to deal with that, but speculation is something that comes with the territory of not winning many hockey games. While Toffoli is yet to replicate his 31 goals scored in 2015-16, that might be tough to do. The connection with Anze Kopitar and Milan Lucic that season was among the most productive L.A. lines in the last 20 years. It’s difficult to find a reason for the blanket on his production this season other than to deem it dumb luck. The Kings are aware of his pristine shot and chance generation, and they’ve been satisfied with what he’s been generating this year. His possession numbers, relative to his teammates, are the best on the team. Any suggestions that there have been shortcomings in his battle element or traditionally sound perimeter play were discounted. What’s happening now is the beginning of some inevitable market correction. Toffoli has a low shooting percentage, excellent possession rates, excellent chance generation rates and will be entering a contract year next season. There is enough evidence here to suggest that he’s as due as any for a bounce-back year, and for a team in need of skill and finishing ability – his quick-strike homerun off Kopitar’s feed was a prime representation of the type of asset his shot is – there’s enough to suggest that he’s as due as any player on the team to rebound in production next year.